Wu Tong Li Youth Hostel, Chengdu, Chiny : Rezerwuj teraz! 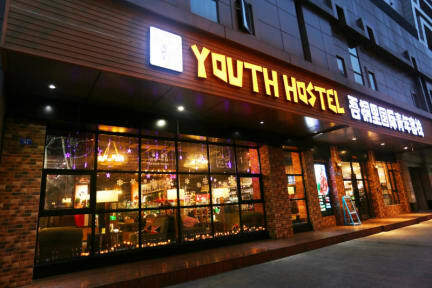 Youth hostel is the best choice for backpackers and travelers on individual tours. Chengdu is the capital of 'Heavenly State' (Tian Fu Zhi Guo), habitat of giant pandas and city of cotton-rose hibiscus. Chengdu is attractive to global tourists for its natural & historical features, as well as the fantastic Sichuan Cousins and Snacks. 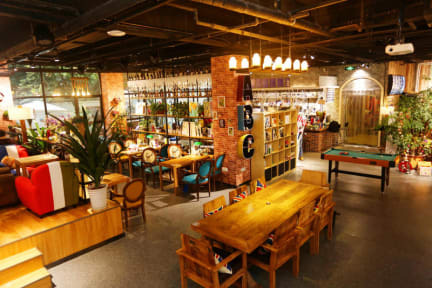 Our hostel is located in the central downtown of the city, along Fu Nan Riverside, it is quite convenient for our guests to enjoy Chengdu tour via public transportations. Our location is walking distance to many popular spots, like Kuanzhai Alley, Wuhou Temple, Jinli, Dufu Thatch Cottage, etc. ; 30 mins drive to Chengdu Shuangliu International Airport, Chengdu Railway Stations; 10 mins bus ride to Chengdu Tourist Bus Station. We have the loft style 4-8 shared bedrooms with bathroom, 6 beds’ room with public washroom and standard rooms available for your selection. Our hostel provides services like Laundry, luggage store, bicycle rent, umbrella… We also have 200 square meters lobby and 200 square meters designed backyard for your resting. The lobby and the yard are the mix entertainment place for Coffee, Beer, Movies and Pool table and BBQ. Here, you can even play table games, UNO, travel with other passengers and eat delicious food together. We have activities here every night. Film night, table game night, gourmet night. You are welcome to join us free of charge.